It's hard to imagine something as simple as the shoebox being completely overhauled. But Puma and Fuseproject have done just that, in a design that will completely transform the brand's supply chain—saving millions in electricity, fuel, and water. "Rethinking the shoebox is an incredibly complex problem, and the cost of cardboard and the printing waste are huge, given that 80M are shipped from China each year," Béhar tells FastCompany.com. "Cargo holds in the ships can reach temperatures of 110 degrees for weeks on end, so packaging becomes an enormous problem. This solution protects the shoes, and helps stores to stock them, while saving huge costs in materials." After spending 21 months studying box fabrication and shipping, Fuseproject realized that any improvement to that already lean system would merely be incremental. 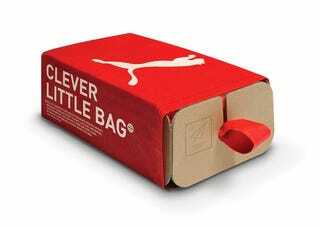 So instead, the "clever little bag" combines the two packaging components of any shoe sale—the bag and the box—with high-tech ingenuity. The bag tightly wraps an interior cardboard scaffolding—giving it shape and reducing cardboard use by 65%. Moreover, without that shiny box exterior, there's no laminated cardboard (which interferes with recycling). There's no tissue paper inside. And there's no throw-away plastic bag. The bag itself is made of recycled PET, and it's non-woven—woven fibers increase density and materials use—and stitched with heat, so that it's less manufacturing intensive. The roll-out is planned for next year. After that? Hopefully, the design will become ubiquitous.